After months and months of anticipation, a flagship from Nokia is finally here! HMD Global, the Finnish start-up, has unveiled the Nokia 8 at an event in London. The company which so far released a few mid-range devices, has finally stepped into the premium market, dominated by the likes of Apple, Samsung and LG. The Nokia 8 is made from a single block of 6000 series aluminium, with an average thicknes of 7.3 mm. The smartphone is 7.9 mm at its thickest point and 4.6 mm at its thinnest. Unlike other flagships, the Nokia 8 is not waterproof, but splash-proof nonetheless, with an IP54 rating. Measuring 151.5 x 73.7 x 7.9 mm, the device weighs a decent 160 gm. 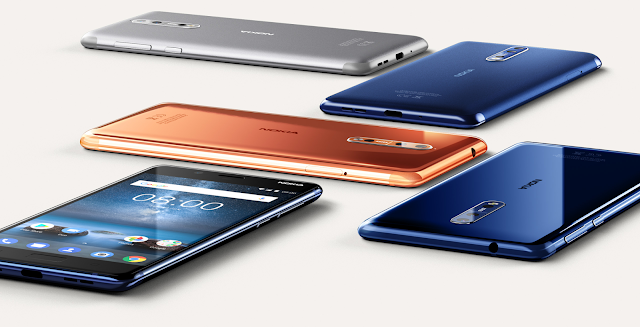 Nokia has included graphite shielded copper heat pipe to keep thermal levels optimal. The antennas are designed similar to iPhone7, blending to the side curves of the phone. 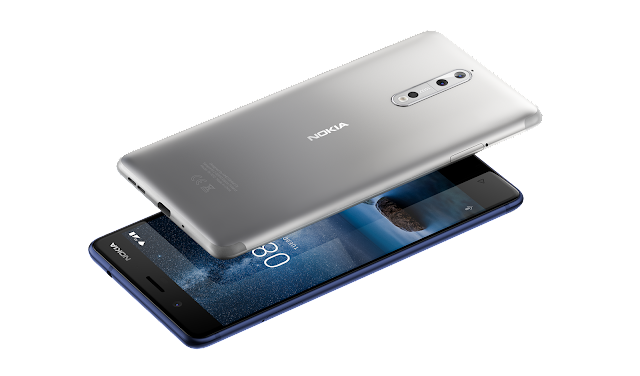 Nokia 8 sports a 5.3 inch IPS LCD display with a QuadHD resolution (2560x1440), with brightness levels maxing out at 700 nits. The display is 2.5D, meaning it curves slightly at the edges and it’s protected by Corning Gorilla Glass 5. Ever since Zeiss announced that they intend to bring back their famed lenses on Nokia phones, we were expecting some great optics. 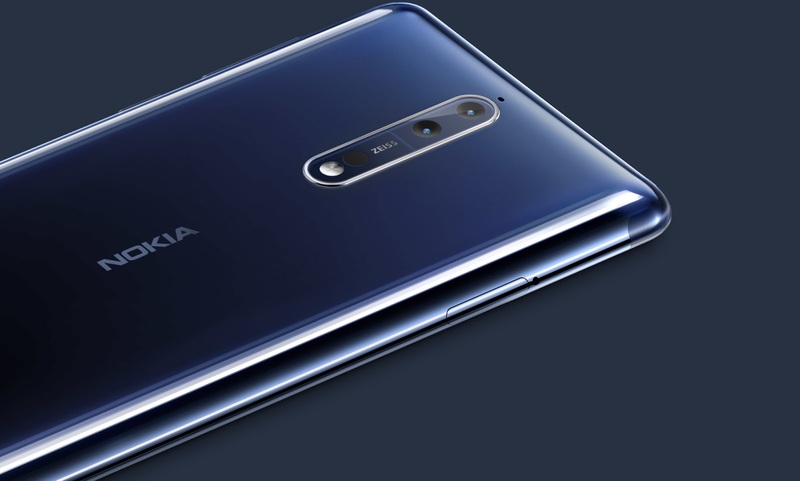 Equipping the Nokia 8 with dual 13 MP sensors, they have managed to live up to the hype. The rear camera setup contains two 13 MP sensors, a combination of color and monochrome ones. With a pixel size of 1.12 um, f/2.0 aperture, PDAF and dual LED flash, the cameras look set to produce some great shots. The front-facing camera also sports the same sensors, the only differences being a slightly wider 78.4 degree of FOV and display flash instead of LED ones. A unique feature call Bothie, by which both the cameras capture pictures at the same time, is also included. They also called this feature as Dual-Sight. This can be used for live-stream videos to give the audience a better view of what’s happening around you. Related to audio, Nokia 8 has OZO, which has the ability to combine the audio from its three microphones using unique algorithms. This means users can record 360 degree spatial surround sound for an immersive experience. Nokia confirmed that such audio codecs will be compatible on phones without OZO, so you can share the recorded videos without losing the amazing high quality audio. The smartphone is powered by the latest and greatest from Qualcomm, the Snapdragon 835 processor with a maximum clock-speed of 2.45 GHz. 4 GB of RAM comes with 64 GB of internal storage (6 GB RAM and 128 GB memory on Gloss Blue variant), expandable up to 256 GB via external hybrid microSD card slot. It will be running Android Nougat 7.1.1 with the company hinting at a possibility of Nokia 8 being one of the first phones to receive Android O update. The stock Android also clears the way for faster security patch releases. Unlimited Google Photos storage and support for Google Assistant are also included. All these will be backed up by a 3090 mAh integrated battery with Qualcomm Quick Charge 3.0 (18W). USB Type-C, capable of data sync speeds up to 5 Gbps, Wi-Fi 802.11b/g/n/ac, Bluetooth 5.0 are the connectivity features. Sensors included are ambient light, proximity, accelerometer, e-compass, gyroscope, fingerprint, hall sensor, barometer, GPS/AGPS+GLONASS+BDS, NFC, ANT+. Nokia 8 will be available at 599 Euros (~Rs 45,000) from September. It will come in four colors - Polished Blue, Tempered Blue, Steel, Polished Copper.